This 5K fun run/walk offers a unique opportunity to participate alongside the U.S. Air Force C-5 Galaxy aircraft. See the largest Air Force Airlifter up close as you run along with views of the Blue Ridge Mountains in the Eastern Panhandle of WV. This run provides a mix of on road and off road surfaces. As you finish, you’ll have the opportunity to walk through this massive airframe and have your finisher photo taken with the C-5 as your background. Share this with your friends and family showing your support of the men and women of your U.S. Air Force Team and the 167th Airlift Wing. Proceeds support the local United Way and the Thunder Over The Blue Ridge Air Show/ Kids Village on September 15-16, 2012. This year we're excited to announce the addition of the kids one mile fun run. 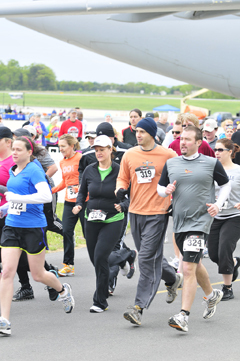 Following the C-5K, children 12 and under can run the final mile of the 3.1 mile course past the C-5 aircraft. There is no cost to participate. Awards will be given to all participants. Directions: From I-81 take exit 8 just south of Martinsburg. Head east on Business Park Drive toward Rt. 11. At the stoplight turn left onto Rt 11 North. Drive approximately .8 mile then turn right onto Sabre Jet Blvd. Please have a valid driver's license available to present at the security gate. Follow the signs to on-base parking. Thank you to everyone who particpated in the 2012 C-5K Fun Run! Race course medical support provided by Ryneal Medical Transport.